Obituary – Cross, Rodney Allen « Perry High School Alumni Association, Inc.
Rodney Allen Cross, 43, died January 6, 2002, at his home near Guthrie. He was born September 1, 1958, in Gatesville, Texas, to Delbert Edward Cross and Marcia Etheline Nichols Cross. The family moved to Oklahoma when Rodney was six months old. 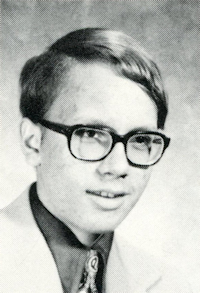 He started school at Perry and graduated from Mulhall-Orlando High School in 1976. He received his Bachelor of Science of Electrical Engineering Technology degree from Oklahoma State University in May 1981. He received his Masters degree in Electrical Engineering from the University of Oklahoma in 1987. He continued working toward his MBA. Rodney married Tara Dawn McGee on August 17, 1978 at Lucien, Oklahoma. To that union was born two sons, Zachary Allen and Nathan Allen. All are charter members of Quail Springs United Methodist Church. Rodney started working at Western Electric in 1981 and continued through its change to A.T.&T. and then Lucent Technologies for a total of 20 years. Rodney was a member of the Institute of Electrical and Electronic Engineers, past president of Telephone Pioneers of America for the Lucent Plant, past president of United Native Americans of Lucent and a member of American Indian Science and Engineering Society. He and his family were very active in community service through these organizations. Rodney was preceded in death by an infant brother. He is survived by his wife, Tara, and son, Nathan, of the home, and son, Zachary, Stillwater; his father, Delbert, Guthrie, and mother, Marcia Stephens, Sumner. A memorial service will be held at 1:30 p.m. Saturday, January 13, at Quail Springs United Methodist Church, 14617 N. Penn with Dr. Bert M. Potts officiating. In lieu of flowers, memorial donations may be made to the National Diabetes Association or American Cancer Society for Gastrointestinal Research.